Enable multiple currencies system wide. Set up currencies per Organization. Switch between currencies once all three areas are configured. Manage account fixed exchange rates between your currencies. Please note that this feature is only available for Operate Enterprise customers. Select System > Operate Settings, then choose Billing Settings. In the Billing Settings area, scroll down to Multiple Currencies and check the checkbox to enable them. To manage the currencies being used within used within your organization, go to Settings > General > Organizations > Currencies. Here is where you will find a list of 30 pre-configured currencies that are ready to use with Operate. For the moment, no new currencies may be added. You can edit an existing currency by clicking the pencil icon next to it. Set the Currency Format - $###,###,##0.00 as well as the Number of Decimal Digits. If you click the currency name instead of the pencil icon, you will be taken to the currency details screen, where you can find information such as the currency name and code, as well as system information related to this currency. 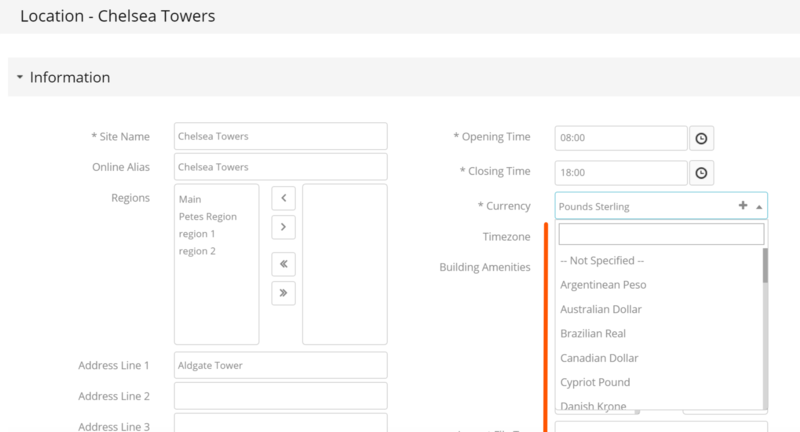 If your buildings are located in different countries, you can set a specific currency for each of them. To do so, go to Space > Locations and click the pencil icon next to the one you want to configure. Next, go to the Information section and find the Currency field. Here is where you can select the Currency with which this Location operates. Please check your Location Page Layout in case you cannot find the Currency field. Please save your changes to ensure the update is made. Once you have gone through the steps described above, you will be able to switch between the currencies that have been enabled for your Locations. For example, if the Location you are managing information for, you can switch to the currency that your Location works with. To switch currencies, use the dropdown found at the top right of your screen, next to your name. Once you make this change, the entire Operate system will show your selected currency. Please note that you need to have more than one currency set on your Locations in order for this dropdown to be displayed. If your Locations all have the same currency set, then it doesn't make sense to display the dropdown, so you will not see it. To set the currency exchange rate, go to Settings > General > Organizations > Exchange Rates. Click the pencil icon next to a currency in order to edit it. Set the exchange rate and click Save. The default exchange rate value for each currency is 1.00. This means that when processing an exchange transaction with another currency, 1.00 unit will be considered.